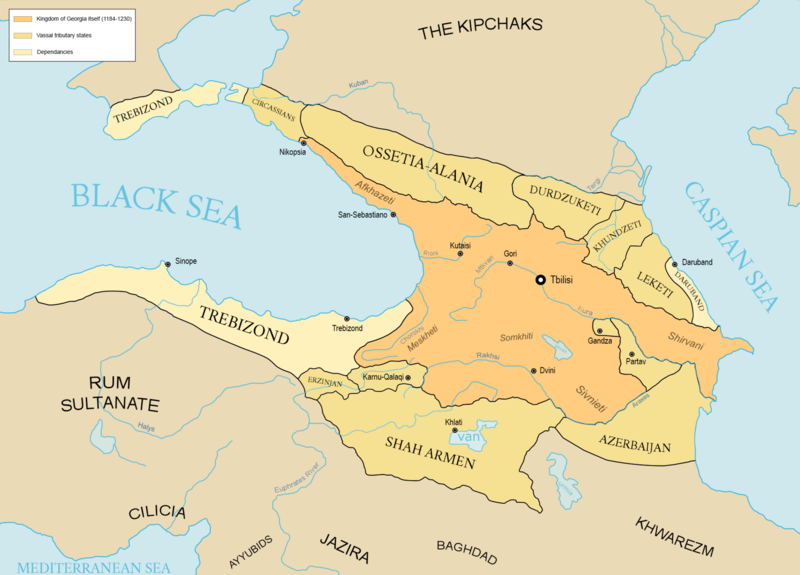 The Kingdom of Georgia as a medieval Eurasian monarchy which emerged circa 1008 AD. It reached its Golden Age of political and economic strength during the reign of King David IV and Queen Tamar the Great from 11th to 13th centuries. Georgia became one of the pre-eminent nations of the Christian East, her pan-Caucasian empire stretching, at its largest extent, from Eastern Europe and the North Caucasus to the northern portion of Iran and Anatolia, while also maintaining religious possessions abroad, such as the Monastery of the Cross in Jerusalem and the Monastery of Iviron in Northern Greece. It was the principal historical precursor of present-day Georgia. Lasting for several centuries, the kingdom fell to the Mongol invasions in the 13th century, but managed to re-assert sovereignty by the 1340s. The following decades were marked by Black Death, as well as numerous invasions under the leadership of Timur, who devastated the country's economy, population, and urban centers. The Kingdom's geopolitical situation further worsened after the fall of the Empire of Trebizond. As a result of these processes, by the end of the 15th century Georgia turned into a fractured entity.